The next few post may be a bit more Akihiro-centric than usual. For some reason someone decided that Aki was being a good little boy and that he deserved some new clothes… what ever. A few weeks ago, by some rare chance I spotted an A Life Garden shirt on the DOA marketplace. I’ve had this list of specific colors that I’ve been wanting to get and this was one of them (yeah, yeah, the boys are color coded-_- and I know I’m not the only one who does this*glareO_o*). I have to say that the drape on these shirts are just as lovely in person as they are when they are photographed. 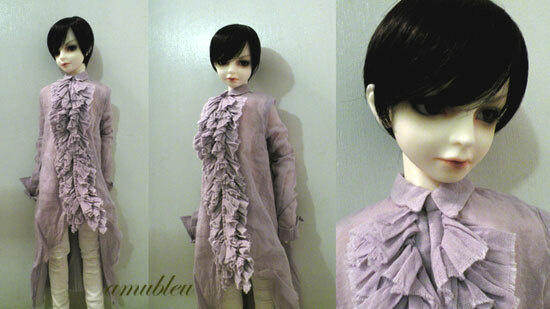 Even though Aki looks like a ghost wearing it I love it on him. I would love to get a few more but one I know will be a challenge to get. I really want a olive green shirt for Hito. It’s on the web site but never on the marketplace. Not liking my camera. These were taken at night and only photo I liked out of the batch was the one right above (though I forgot to edit the stray hair on his face… D:< do it later). I like it for several reason other than quality. I almost gave up on the whole batch but thought I would see if Photoshop could save some. I don’t want to go back to a tiny point and shoot but I don’t know if I want to take on a DSLR just yet (I’m too lazy… to much to learn) I finished up the last of my commissions for the year this evening and started working on the Owl sweater for Hito. I have most of it figured out and modified for a more boyish figure except for the yoke area. There is a bit of short row workings right above the owls. I’m a bit rusty when it comes to short rows so I may have to figure that part out as I go (which I hate doing).